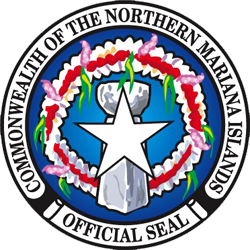 Householder and spouse or unmarried partner comprised half (50.1%) of the total population in the CNMI in 2017; children was 35.7%, siblings and parents was 3.0%, grandchildren was 5.2%, other relative was 2.7%, while nonrelative was 3.3% of the total population. The householder and spouse or unmarried partner’s percentage was higher in Rota (56.0%), than in Tinian (55.4%) and Saipan (49.5%). The children percentage was higher in Saipan (36.0%) than in Tinian (34.1%) and in Rota (32.1%). The siblings and parents’ percentage was higher in Rota (4.3%) than in Saipan (2.9%) and in Tinian (2.3%). The grandchildren’s percentage was higher in Saipan (5.5%) than in Rota (4.1%) and Tinian (1.9%). The nonrelative’s percentage was higher in Tinian (3.6%) and Saipan (3.4%) and lower in Rota (2.4%). Within Saipan, householder and spouse or unmarried partner’s percentage was highest in District 3 (55.1%) and lowest in District 4 (44.3%). The children’s percentage was highest in District 2 (39.4%) and lowest in District 3 (34.2%). The siblings and parents’ percentage was highest in District 5 (4.4%) and lowest in District 4 (0.3%). The grandchildren’s percentage was highest in District 4 (13.8%) and lowest in District 2 (3.0%). The other relative’s percentage was highest in District 5 (4.8%) and lowest in District 2 (0.3%). The nonrelative’s percentage was higher in Districts 4 and 5 (both 4.6%) and lowest in District 1 (1.9%). 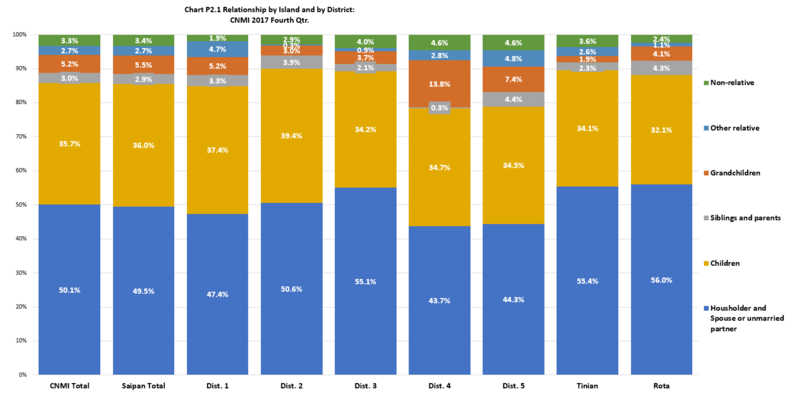 LFS 2017 Table P2.1 Relationship by Island and by District: CNMI 2017 Fourth Qtr.